- All bedrooms have either a Tempur-Cloud or Sealy Optimum mattress. - Apple TV in living room. - Professionally decorated with local art throughout the home. - Built in surround sound in living room. - All smart TVs throughout the home. - New to rental program. - Built in blue tooth speakers throughout the home and porch. 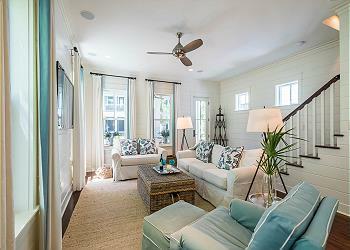 DETAILS: 39 Wisteria Way also known as "All In" is a beautiful new home that is professionally decorated by the local art of 30A. This two story abode features three king bedrooms, each with a private bathroom and impeccable accommodations for up to twelve guests. The bunk room includes two sets of full over full bunk beds and is perfect for kids! Only a short over to the Dragon Fly pool to cool off and enjoy the Florida sun. Explore WaterColor and its neighboring community Seaside for delectable shopping and dining options. 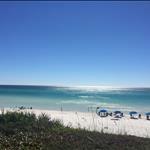 The pristine beaches of the Emerald Coast are also just a two minute drive away. Check availability and book your next beach vacation today! Wonderful home and beautifully decorated in a quiet neighborhood. Comfortable and well stocked. Near to Publix and close to the best restaurants. Enjoyed drinking coffee on the porch in the mornings and the short walk to a nice pool. We rented a golf cart to go to the beach but driving our SUV was just as easy. Access to bicycles was a plus. We are so thrilled that you enjoyed your vacation with us in Watercolor! We agree that this home is in a wonderful spot to enjoy all that Watercolor has to offer with great ease! We look forward to hosting you all again soon! This was our second year staying at Water Color with 360 Blue. The accommodations could not have been nicer. The three master suites were perfect for our two college aged sons and Mom and Dad. The beds were luxurious and the entire house was decorated like a show house. We enjoyed the bikes and beach. We'll definitely be back. Just looking at this photo makes us hungry! We are so glad you enjoyed your stay in the Watercolor Community, and the convenient bikes provided with the home! Watercolor truly has so much to offer! Thank you for choosing 360 Blue for your family's stay, we look forward to your next stay with us! Come back and visit soon! Such a lovely home!! Beautiful and well maintained. The large bedrooms and bathrooms were like an oasis. We had four women in our group and loved the accommodations - stairs may be too steep for toddlers, but older children will not have a problem. Porches are so relaxing!!!! What an amazing view! We are so happy to hear that you had such a great stay in this beautiful home. We look forward to having you all back soon! Beautiful home, relaxing, spacious and enjoyable! Looks like everyone is having a great time. 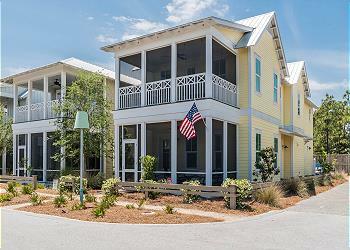 We are so honored that you chose 360 Blue for your beach getaway! We hope to have you back soon! What a beautiful house! The home owners couldn't have been more gracious!! The AC went out for a brief amount of time and they sent us a very generous basket & gift card for the inconvenience. So very thoughtful!!! Looks like they are having a ton of fun! We are so happy to hear that you enjoyed the basket, and this home. We hope to have you all back very soon!